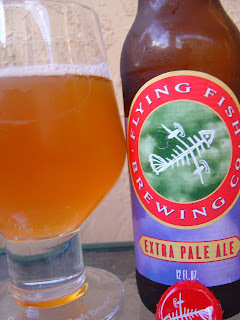 Today I'm drinking Flying Fish Extra Pale Ale brewed by Flying Fish Brewing Company in Cherry Hill, New Jersey. Malty baked bread aroma with a hint of fruit. A fruity apple starts things out, and basically that is the only flavor you will taste. Strong prickly carbonation is there to make things interesting, but in the end this is an extremely bland and boring, slightly sweet beer. Beware! You might be drinking it right now and not even know it! The End.